Currently we offer eight styles of Windsor chairs plus a Windsor stool. All chairs are made from solid wood - much of it harvested by Johan. The process for building these chairs starts with turning the legs on a lathe. Next the seat is hand-carved to achieve the proper contour to maximize comfort - a decorative edge is added using a specialized gouge tool. Once the seat and legs are finished, spindles are made by first splitting sections of wood. These pieces are then rounded to shape using a spoke shave. Any bows - the curved pieces - are steam-bent. Photos of the different steps used to build a chair can be seen on our Photo & Video Gallery page. The Nantucket Fan Back is a large chair, perfect next to the fireplace, or in a reading corner. This impressive chair has hand-carved handholds and top rail. The seat is carved using a gutter adze, a scorp, compass plane. The spindles are made from green wood, first split, then shaped with a variety of hand tools. Because these spindles are riven rather than turned, they are considerably stronger than factory built chairs. The photo at right shows the detail of the arm rest handhold. This detail is hand-carved by Johan. Overall height is 3 feet 9 inches. Seat depth is 22 1/2 inches with brace. Overall width is 2 feet 7 inches. 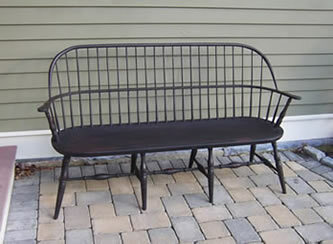 Shown in black-over-red milk paint finish. This handsome chair retails for $900 plus shipping. The traditional Windsor Sackback is often seen as the captain's chair at the table. The chair is made of pine (seat); oak (spindles) and maple (turned legs). All chairs are made to order. Johan uses milk paint to finish these chairs. The photos shown are black-over-red. A red coat is first painted on the chairs followed by a black coat. The black is rubbed out in areas where normal wear would remove the paint. This distressing makes the chairs look like well-worn antiques. Many color combinations are available. This chair retails for $600 plus shipping. Overall height is 3 feet 2 1/2". Overall width is 2 feet. 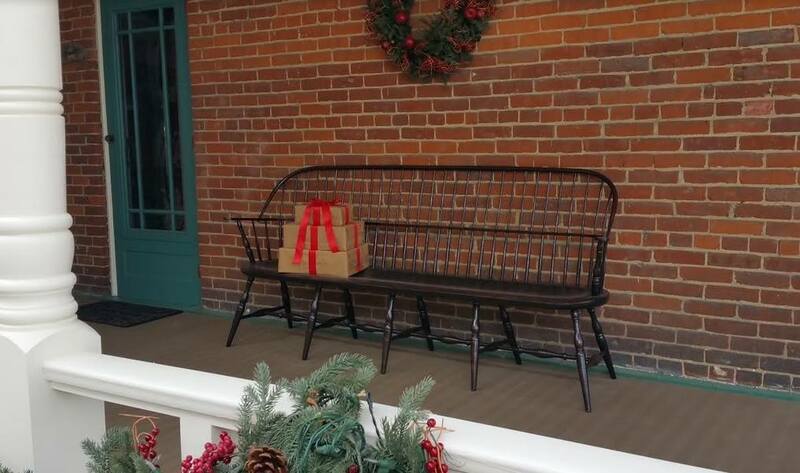 The Windsor rocker is essentially a sack-back with a high comb on the back and rockers, of course! Johan makes this rocker for his children's first child - the grandchildren have been rocked in it from their first day home, and will someday rock their own children and grandchildren in this chair. What a lovely heirloom to give to your grandchildren! Overall height is 3 feet 10 inches. Overall depth with rockers is 2 feet 10 inches. Overall width is 24 inches. Seat depth is 17 inches. This chair retails for $650 plus shipping. We offer the Boston settee in three sizes - 2 person; 3 person and 4 person. Great for a foyer, in front of the fireplace, or as seating at the kitchen table, these settees are very versatile. The spindles are hand-carved. Top bow and arm bow are both hand-shaped then steam-bent to achieve the curved shape. The 2 person settee retails for $950 plus shipping. The 3 person settee retails for $1,750 plus shipping. The 4 person settee retails for $2,600 plus shipping. 3 person seat is 61 inches. Overall height is 37 inches. 2 person seat is 41 inches. Overall height is 37 inches. The 4 person settee is 81 inches. Overall height is 37"
The New York City bow back side chair features a single bow with a back-brace. It makes a perfect companion chair to the Continuous Arm chair. Its seat is shaped the same - tapered toward the front. Overall height is 3 feet 1 1/2 inches. The New York City side retails for $450 plus shipping. This detail photo shows the brace back structure of the New York City side chair. The Continuous Arm Windsor is one of the most elegant forms. It features a single piece of wood is formed then steam-bent with a double-bend to form the arm rests and back bow. This chair has the same style seat as the New York City side shown above. This chair is 38 inches in overall height and 23 inches in overall width. 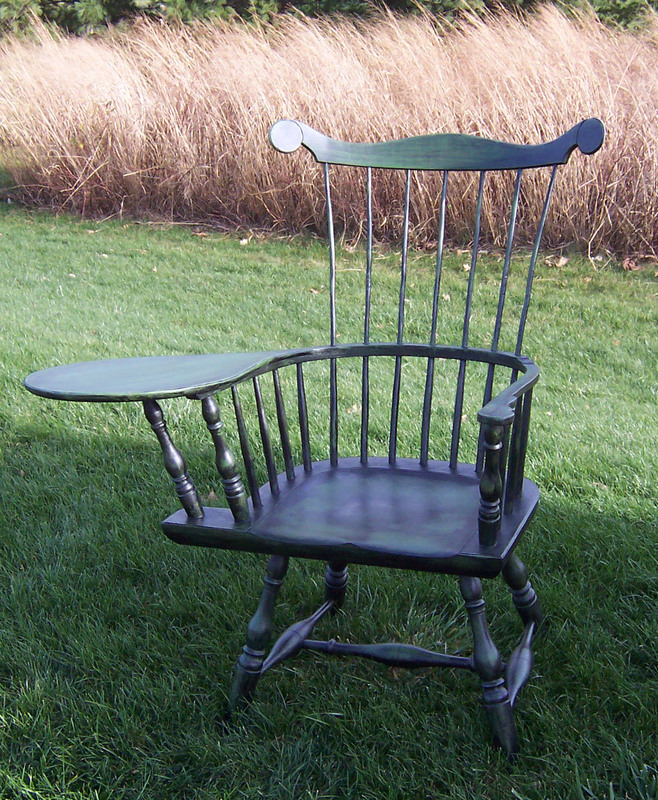 The Writing Arm chair is similar in size to a Nantucket Fan Back It is 41 inches in overall height and 35 inches at the widest point including the writing pad. The pad can also hold a tablet. The chair can be made to accommodate left or right-handed people. It retails for $950 plus shipping. This Windsor stool features bamboo-style turned legs and a turned round seat. The stool is 20 inches in height. The seat has a 13 inch circumference. The stool retails for $150 plus shipping.